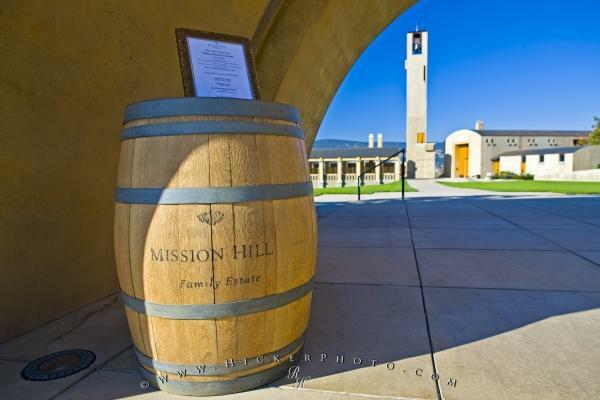 A wine barrel placed beneath the entrance arch and keystone at Mission Hill Family Estate Winery in BC, Canada. The quintessential icon of a vineyard, a wine barrel is one of the first things to greet the visitor to Mission Hill Family Estate Winery situated on the Western shores of Okanagan Lake. The Okanagan is a region of British Columbia that is perfect for establishing a vineyard with its balmy summers and rich soil, the founder of Mission Hill Family Estate Winery definitely thought so. Wine barrel and sign at the entrance to Mission Hill Family Estate Winery, Westbank, West Kelowna, Kelowna, Okanagan, British Columbia, Canada. Photo of a wine barrel at the Mission Hill Family Estate Winery, British Columbia, Canada. Pictures from photo gallery "Okanagan Pictures"
This picture is part of the photo album "Okanagan Pictures" - there are more beautiful images waiting for you.